The City of London Choir is committed to developing the participation of young people in its performance and celebration of choral music. Most of our members can trace their love and knowledge of music back to childhood, and particularly to singing in a school or church choir. The choir takes pride and pleasure in its record of working with children: we have performed and recorded with school choirs on a number of occasions, and inviting the smallest members of the audience onto the stage has been a cornerstone of our Christmas family concerts for many years. For our performance of Bach’s St Matthew Passion in March 2012, we invited three inner London primary schools to join us in an innovative project to form the Ripieno Chorus. Professional singing teachers, including some of the soloists performing in the concert itself, went into the schools to run a number of workshops, teaching the children their notes and singing technique, and immersing them generally in the experience of singing one of the greatest choral works ever written. Click here to see some of the feedback. Recognising the fact of choral life that far fewer tenors and basses are applying to join choirs than sopranos and altos, the choir seeks to address this by having a scheme which gives incentives to young tenors and basses to take up choral singing with a leading London choir. The CLC is fortunate in having strong tenor and bass sections, but is only too aware of current trends and, with an eye to the future, is looking to stimulate interest among young tenors and basses to experience the pleasures and satisfaction of choral singing. We are delighted as part of our education programme to offer two bursaries per season per voice part for aspiring young tenors and basses aged 16-19. Bursaries cover music costs as well as travel expenses to weekly rehearsals. The Scheme also includes associate membership of the choir for two concert seasons and nine one-to-one singing lessons per season with top vocal coaches. 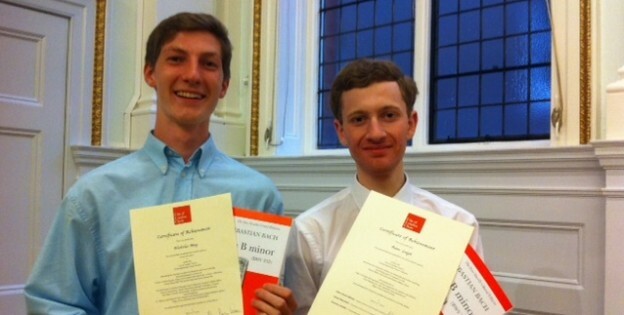 Apprentice Tenors, Nick and Peter (pictured above receiving certificates and scores of the Bach B minor Mass on completion of their apprenticeship with the choir), highly recommend the experience – see their testimonials here. For more details, please send us an email for the attention of the YABATS Secretary. This scheme is aimed at young budding sopranos and altos (tenors and basses are already covered by our Young Apprentice Bass and Tenor Scheme). It encourages young people, aged 16-19, to experience the joys of harmony and the power of singing great music together, performing in London’s principal venues with top musicians. Young singers become full members of the choir and pay only a token subscription – a fraction of the amount paid by other choir members. See what our first Young Singer, Maya (2013-15), says about her experience here. This new scheme, which the City of London Choir has launched in collaboration with the Classical Roadshow, provides young people with front row concert seats, allowing them direct and unhampered connection with the sounds and excitement of performance. For more details, please send us an email for the attention of the General Manager.